The Department of Psychiatry welcomes Dr Xiaojian Jia, Dr Xiaoyin Ke and Dr Zhiwen Zeng from Shenzhen Kangning Hospital. Professor Chris Pantelis, Professor Nicola Lautenschlager and Ms Lina Pepe, on behalf of the Department, hosted a welcome session on Friday 1st of September 2017. 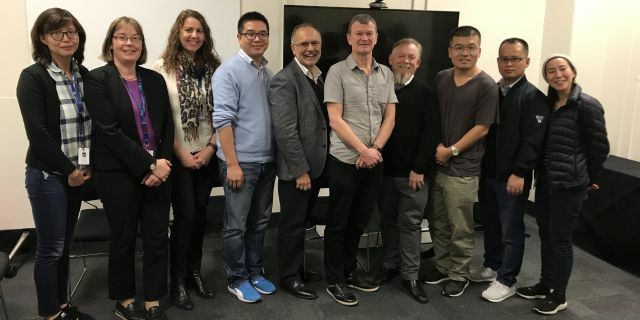 Dr Jia, Dr Ke and Dr Zeng’s research placements are under the Three Famous Project agreement between The University of Melbourne and Shenzhen Kangning Hospital, which is to provide psychiatric training and research, and clinical supervision to mental health professionals in Shenzhen. Professor Ashley Bush and Professor Andrew Lawrence from the Florey Institute of Neuroscience and Mental Health, Professor Dave Coghill from the Departments of Psychiatry and Paediatrics will provide six-month research supervision respectively in genetic psychiatry, neuroscience and child psychiatry.